April's Little Family: The Coupon Game. I thought I would finally outdo myself today, but the checker gal wouldn't honor my expired coupons. *sigh* Regardless, it was still noteworthy. One day... one day I will beat my own record! p.s. Tonight's whole dinner only cost about $1.00 per person! Check it out here. 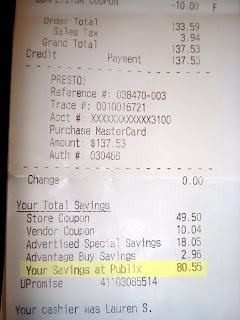 How the HELL did you have $50 in straight up Publix coupons? I have to get back on my game. I got slack on clipping coupons about a month ago and I've noticed our grocery bill go through the roof! Thanks for the reminder that saving something is better than nothing. BTW, where do you mostly get your coupons from? Internet? Newspapers? Magazines? Ok, first off, thanks for visiting me...second off, I need lessons!!! Great savings! @ erin: a lot of them were the $10 off $50 type coupons. @ norris: newspapers, magazines, newsletters... anywhere i can find them! this week several were from magazines, but that's not always the case. @ jilly: thanks! it's all a matter of keeping your eye out for coupons and deals :-) took me a long time to get the hand of it! Love the coupon game! Blessed that my store never seems to check the expiration dates on the coupons! Did amazingly well last night, can't wait to post about it later tonight when my kiddos go to sleep...spent $80, saved $78, it was a GREAT week!